TURIN – Fiat-Chrysler CEO Sergio Marchionne fears poor handling of the sovereign debt crisis could push Europe into a slump even more drastic than a "classic" recession. But Marchionne does not see Europe's troubles causing a chain reaction. "I think that a global recession is possible but unlikely," he told Automotive News Europe. 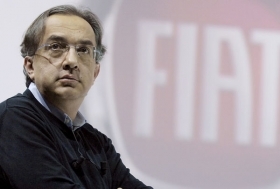 Marchionne said that by following key steps taken during the 2008-2009 global downturn – protecting cash reserves, cutting inventories and boosting labor flexibility – European automakers could survive a recession of about 12 months. The CEO is worried that mismanagement of the debt crisis by Europe's elected officials could cause the euro to fail. "If the issues that are impacting Greece and other peripheral countries, including Italy, get mishandled then there could be consequences that are beyond the recession argument," he said. "If anything happens, it's going to be more drastic than a classic recession." Any recession could be confined to Europe, Marchionne said. "There are parts of the world that are totally immune to this by now. I think Latin America, North America and China would not be directly impacted by a failure of the European economic system," he said in an interview at Fiat's headquarters here. The forecast size of Europe's anticipated 2012 new-car sales slump varies. J.D. Power Automotive Forecasting sees western European passenger cars sales declining 1.3 percent next year to 12.62 million from an expected 12.79 million this year, which is down 1.4 percent on the 12.98 million units sold in 2010. Western European sales peaked at 14.80 million in 2007, declined to 13.56 million in 2008 and rebounded to 13.66 million in 2009 because of government subsidies given to encourage sales. Financial analysts at Goldman Sachs are slightly more pessimistic. They expect 2012 western European new-car sales to fall about 3 percent to 12.4 million units. Market watchers at Morgan Stanley are even more pessimist. Including light commercial vehicles in the forecast, Morgan Stanley expects a 5 percent decline to 13.5 million units from the 14.2 million sales it expects this year. The worst-case scenario for Europe in 2012, according to Morgan Stanley data, would be a 10 percent drop in car and LCV sales to 12.78 million units. In their prediction the analyst sees sales in Spain and France falling 12 percent each and Italy down 10 percent.